What do you feed an American president who famously likes his steak well done and served with ketchup, and counts the Big Mac as one of his favourite foods? That's the problem vexing chefs in Asia this week as Mr Donald Trump travels through the region on his marathon 13-day visit to Japan, South Korea, China, Vietnam and the Philippines. China apparently decided to keep it low-key, probably in keeping with President Xi Jinping's signature anti-graft campaign which frowns on frivolous spending by officials. Kungpao chicken, creamy seafood, and beef in tomato sauce headlined the menu at the state banquet Mr Xi threw in Mr Trump's honour on Thursday (Nov 9), according to Chinese media. They based their reports on photographs of the menu posted online by Mr Lei Jun, founder of Chinese mobile phone maker Xiaomi and one of the banquet guests. Lunch: There was no raw fish for Mr Trump, who is no fan of sushi. For his first lunch with Prime Minister Shinzo Abe before their round of golf, they ate burgers made of US beef with colby jack cheese, cooked by Munch's Burger Shack in Tokyo. The burgers were served with Heinz ketchup and mustard at the fancy Kasumi Country Club, north of Tokyo. The burgers sell for US$10.50 (S$14.30) in store. As for drinks, there was nothing fancy - just Mr Trump's favoured Coke. Dinner: Mr Abe took his guest to an upmarket teppanyaki restaurant, Ukai, where wagyu beef was cooked on the griddle in front of them. They were served a special menu that included grilled Hokkaido scallops and lobster in bisque, the restaurant's best quality Wagyu fillet and sirloin steaks, an Ukai spokesman told local media. Dessert was chocolate parfait. Shares of the Ukai restaurant company jumped 7.3 per cent the next day after it was reported that the two leaders had dined at its flagship Tokyo store in Ginza. Lunch: A simple meal of salad, teriyaki chicken and vanilla ice cream. Dinner: The meal at Akasaka Palace was more of a traditional Japanese fare: grilled fish marinated with miso paste, rolled omelette, duck and onion on skewer, burdock rolled in wagyu beef slices, Matsutake mushroom in steamed egg custard, Ise lobster salad, Japanese beef steak, steamed rice with mushrooms and miso soup with vegetables. Dessert was fruits and ice cream. Lunch and afternoon tea: At Camp Humphreys, the US military base south of Seoul, the US president chowed down lunch with US and South Korean troops. Afternoon tea at the Blue House presidential palace included dried persimmons stuffed with walnuts and coated with chocolate. The persimmons were picked by the South Korean First Lady from trees grown on the estate of the mountainside presidential palace and dried for several weeks. 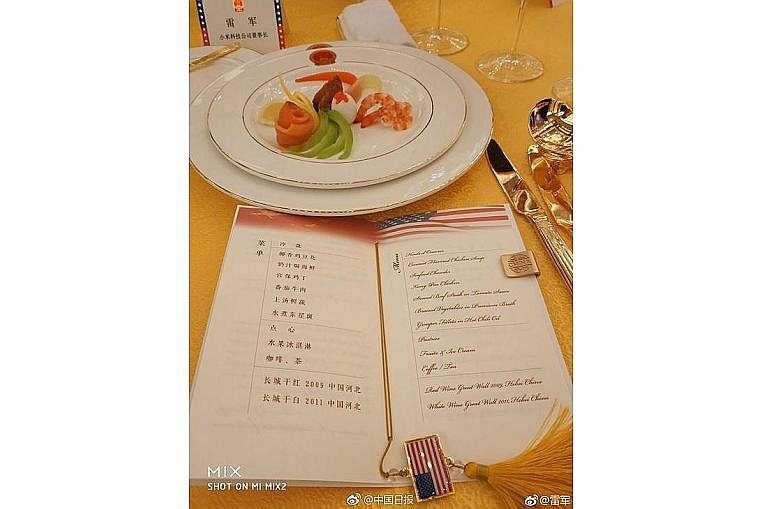 Dinner: For the state banquet, South Korean chefs opted for a menu that they call "Asian-American fusion," which they said would appeal to Mr Trump and also showcase Korean cuisine. 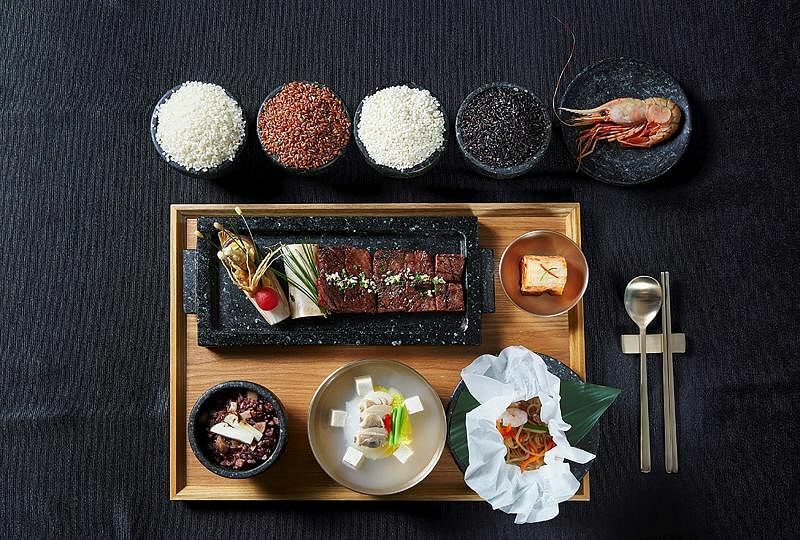 On the menu: Corn porridge with fresh herb and vegetable side dishes, grilled sole - Mr Trump's favourite fish - from Geoje island, the hometown of South Korean President Moon Jae In, pine mushroom rice with grilled Korean beef ribs seasoned with a special sauce made with a 360-year-old soy sauce. Perhaps the most "contentious" ingredients of this dinner are the prawns, which the South Korean presidential office said were caught near a disputed island claimed by the country and Japan.The Seoul-controlled island off the east coast – called Dokdo in Korea and Takeshima in Japan – is at the heart of a decades-long territorial dispute and diplomatic row between the two countries. Dessert was triple chocolate cake with raspberry vanilla sauce, and cinnamon punch granita served with dried persimmons.